Nice subtle subliminal messaging. I don't see any reason for you not to start building; it's not like the hardware design it going to change any time soon. The only thing that might happen is software improvements and bugfixes, but I don't see that changing the hardware design. In other news, hours of patient soldering yielded me two more fully-functional TI-83+ calculators out of my piles and piles of calculators with "dead" LCDs, except now I have seven fully-functional TI-83+/ TI-84+/ TI-84+SE calculators, and only six endpoints in my network. Who wants to mail me their spare I/O cables? I was referring to the potential hopeful USB implementation, but I guess that would be in a future hardware revision? Oh, and how do I get 5V from AA batteries? USB SUPPORT IS A MUST! RESISTANCE IS FUTILE! USB SUPPORT IS A MUST! RESISTANCE IS FUTILE! USB SUPPORT IS A MUST! RESISTANCE IS FUTILE! USB SUPPORT IS A MUST! RESISTANCE IS FUTILE! USB SUPPORT IS A MUST! RESISTANCE IS FUTILE! USB SUPPORT IS A MUST! RESISTANCE IS FUTILE! USB SUPPORT IS A MUST! RESISTANCE IS FUTILE! USB SUPPORT IS A MUST! RESISTANCE IS FUTILE! USB SUPPORT IS A MUST! RESISTANCE IS FUTILE! USB SUPPORT IS A MUST! RESISTANCE IS FUTILE! USB SUPPORT IS A MUST! RESISTANCE IS FUTILE! The circuit I drew will be perfectly happy with 6V instead of 5V, so I wouldn't worry to much about that. So no exploding circuits if I stick 6V (4 AA)? SUPPORT USB FOR CALCNET2! CAN'T YOU HEAR THE CRIES OF MANY WOMEN AND CHILDREN? THEY'RE STARVING FOR USB SUPPORT! SUPPORT USB FOR CALCNET2! CAN'T YOU HEAR THE CRIES OF MANY WOMEN AND CHILDREN? THEY'RE STARVING FOR USB SUPPORT! SUPPORT USB FOR CALCNET2! CAN'T YOU HEAR THE CRIES OF MANY WOMEN AND CHILDREN? THEY'RE STARVING FOR USB SUPPORT! SUPPORT USB FOR CALCNET2! CAN'T YOU HEAR THE CRIES OF MANY WOMEN AND CHILDREN? THEY'RE STARVING FOR USB SUPPORT! Nope, shouldn't be any problems. If you want to be save, you can use 500-ohm or so resistors in place of the 330-ohm resistors, but that's not entirely necessary. Four rechargeable AA cells would get you 4*1.2V=4.8V. True, but even with the 6.0V (above for fresh cells, under for dying cells, as you know but alberthro might not) I see no reason why my circuit would have difficulties. My only concern would be if the 6V accidentally found its way into the clock or data line of the CALCnet hub. Great! Now... how do I connect these guys again to place in a box? It seems your eyes are a bit blurred with those interesting lines of text, eh? I would need to implement recharging, then. Then connect it together on a PCB, there's no reason not to do that. Yeah, but I don't have PCB printing software or equipment. @Merth: But I only have one pair, and they take 1.5 days to charge. You can use either standard hole-only or parallel-row perfboard, but I'm going to assume that you don't have it. Wire to wire connections, with solder? That's how you'd use the hole-only kind; for the parallel-row kind, I usually cut the rows into segments as necessary with a craft or xacto knife, then use solder bridges to connect adjacent rows. Goodie! So how many ports should I include then? And how should the plastic case be? It's up to you; I'd love for you to use your creativity and try to come up with something cool. Since you're one of the first people to build a CALCnet hub, you're in the rare position of being able to give me alternative ideas other than the pictures and designs in my mind before I start writing up documentation and instructions. I'd love to do a design! However, I would probably need some help along the way. Do you have a FB and GMail? Those are my primary 2 sources of contact. Of course I do. You really should post up any questions in a topic that you start for that purpose, or in this topic if you must, because I'm going to assume that other people would run into the same issues. I was more or less talking about design issues. Like where to put things, etc. Obviously, any building issues will be posted at Cemetech. I assume your FB is [censored]. Post design issues and concepts here too! I suppose you could post them on FB or via email, but I like having everything nicely documented here. And yes, the FB username you posted is correct. 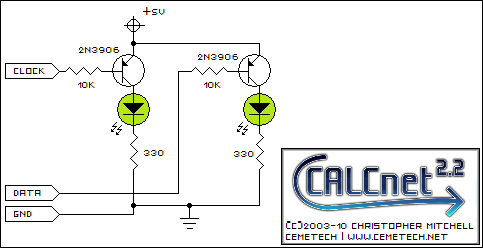 *bump* Here's an alternate schematic that uses two PNP transistors instead of four NPNs. It unfortunately requires that the power supply be relatively close to 5V; the NPN circuit is less sensitive. There are 199 users online: 11 members and 188 guests. Members: calclover2514, commandblockguy, gplastic, Jeffitus, kg583, Michael2_3B, RogerWilco. © Copyright 2000-2019 Cemetech & Christopher Mitchell :: Page Execution Time: 0.224040 seconds.